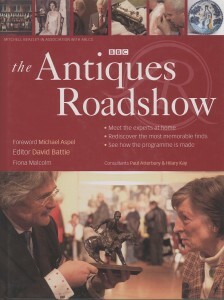 One day I hope it will be possible to obtain a clip from one of my BBC ‘Antiques Roadshow’ recordings to show here but in the meantime, to the left is the 2005 edition of the ‘Antiques Roadshow’ book. I am on the cover examining a fine quality Russian bronze equestrian group explaining the salient points to the happy owner. It is such a joy and privilege to be a recording specialist on the the ‘Roadshow’; the wide and varied range of items that come in to every show never cease to amaze me, as well as stretch my knowledge. Almost every show I see an item that I have never encountered before. The 2011 recording season is in full swing with a wonderful oak chair, dated 1681, thought to have been brought over to Northern Ireland as part of the Plantation Movement. 2010 was a busy year for the experts and production team battling with the English weather with an increasing number of shows filmed in the open air. I have been relatively lucky in only having a damp and dismal day weather-wise twice, the first at the National Trust house Tyntesfield near Bristol and again at the Castle of May in the north of Scotland. In contrast I filmed the hottest day of the year so far at Kings College at Cambridge University. It was a glorious day, wearing a Panama hat working as punts glided by along the river Cam. To be in such cerebral surroundings was a real treat, sneaking in a visit to the Pepys library at nearby Magdalen College and a tour of the roof vaults above Kings College Chapel – standing high up in the air on some 1800 tons of beautifully engineered stone cut and fitted in the 15th century! A lady at Kings was too shy to let me record her very rare walnut nécessaire, probably made in Prague in the 1820s Vienna style – what a gem! My favourite however was a little writing desk at Tyntesfield made in Australia by the Melbourne makers Goldman who have a piece in the local museum. Made circa 1910, it was stamped ‘European Labour Only’ – to promote goods made by the more established workers from the old country who were facing stiff competition by the new immigrants from Asia. One favourite location was at the Victoria Swimming Baths in Manchester in 2004, the “Roadshow’s” twenty-sixth season. To my delight I filmed a lady who had unearthed a Linke pedestal found in the basement of a house she had bought. A variation of Linke Index Number 82, I later recorded an interview for the B.B.C. explaining the significance of the Linke registres or Day Books. At another location, the old Brooklands racetrack, a gentleman was standing in line with an occasional table he had bought and correctly identified as a Linke occasional table!